Yellon nominated for Svenska Designpriset - Yellon - Arkitektur, Design och Kommunikation - Jönköping • Malmö • Stockholm • Berlin. Yellon nominated for Svenska Designpriset - Yellon - Arkitektur, Design och Kommunikation - Jönköping • Malmö • Stockholm • Berlin. After the first selection by the design jury, it is now clear that Yellon has proceeded in the competition with its contribution ‘Harry T. Vik – an appreciated comic book’ for the final vote for Svenska Designpriset (Swedish Design Award). An award where all people who are interested can vote. The comic book was launched in May 2017 and its nomination for Svenska Designpriset proves that it is worth doing things that no one else in the business dares to do. From a communicative perspective, the comic book is a light-hearted way of communicating which displays both humour and self-distance. It’s perfect for Sweden’s funniest meeting place, Happy Tammsvik. Idea, creative design and production by brand experience agency Yellon. ‘To us as an agency, assignments are often about extending and creating feelings for brands through communication. In this case, together with a customer whose trademark it is to take humour seriously. 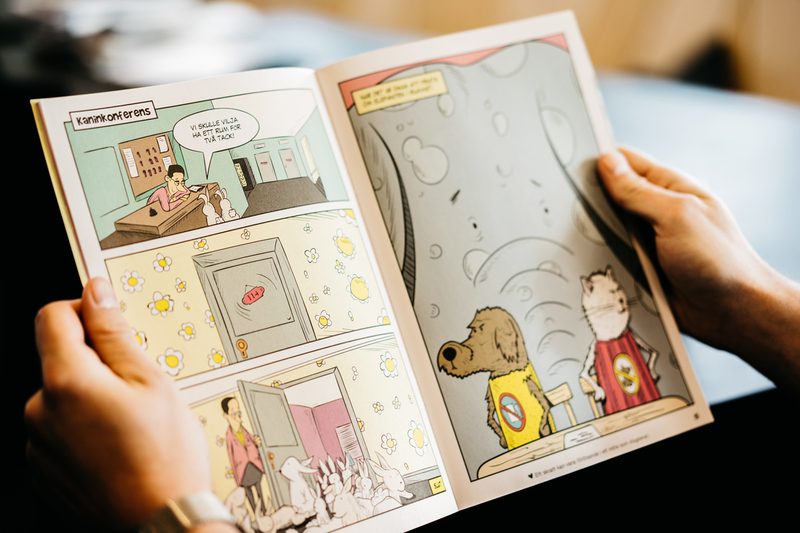 I think that we are successful in this endeavour by having launched the industry’s first comic book,’ says Gabriella Fäldt, Project Manager and Copywriter at Yellon. Svenska Designpriset is a competition for anyone who works within the field of graphic design and product design. 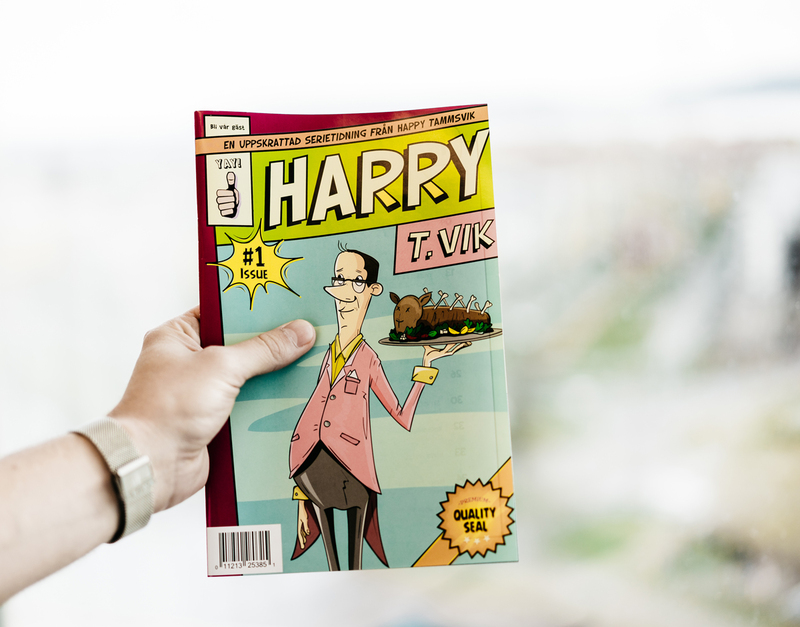 With the conference industry’s first comic book “Harry T. Vik”, Yellon has been nominated for the prize, competing in one of the categories for editorial work. ‘It is great fun that our comic book has been nominated. It means a lot to us internally and the guests who receive it in connection with their stay here are both surprised and happy,’ says Tanja Askrabic, Marketing Manager at Happy Tammsvik. ‘A nomination is proof that our thinking really does develop our customers’ brands, but it takes a courageous customer to enable us to do something outside the box,” says Markus Leijonberg, CEO of Yellon. You can vote at www.designpriset.se, open to everyone between 4 and 10 September. Yellon competes in ‘1D – Redaktionellt – Kundtidning – Print’. The winners will be announced on 19 October at Rondo in Gothenburg.